One can’t help but be struck with a sense of awe when walking amongst the magnificent and massive totem poles in the Great Hall of UBC’s Museum of Anthropology. However, the history of the University's collection and preservation of totem poles and other large scale First Nations carvings actually predates the construction of the Museum (1976) by almost fifty years and forms a very interesting chapter in the institution’s history. In 1927 the Alumni Association presented the University with two Musqueam poles during the second annual homecoming. The Musqueam nation agreed to sell the sole surviving totem poles to the Alumni Association only on the condition that they would be placed on the University campus adjacent to the Musqueam reserve. Chief c̓səmlenəxʷ (spelled "Tsem-Lano" at the time) and other members of the Musqueam community attended the presentation dressed in traditional regalia. His explanation of the symbolism of the three-generations-old totem poles in his Musqueam language, hən̓q̓əmin̓əm , was translated into English for the audience. The carvings were later installed in the University’s Botanical Garden. There is no further mention of the totem poles in University records until 1941 when Hunter Lewis in a memo to President L.S. Klinck indicated that the Musqueam poles had become badly and extensively decayed. He suggested that the totem poles "are not merely attractive ornaments but also objects of art, with considerable aesthetic and historic value, and of great interest to a public that extends beyond the limits of the University...". Unfortunately nothing seems to have been done as Lewis some six years later wrote to the UBC President Norman Mackenzie again citing his concerns about the deteriorating totem poles. In 1947 Lewis again wrote to President Mackenzie to propose that the University acquire additional totem poles. He observed that good Tsimshian poles from the Nass River and good poles from the Queen Charlotte Islands were available only in limited numbers while Kwakiutl poles from the Skeena River and Alert Bay were more numerous because totem carving developed later amongst the Kwakiutls than the other two tribes. Lewis emphasized that because the practice of carving totem poles had been discontinued, the number of poles available decreased with each passing year. Many poles were simply falling and rotting, many in deserted Indian villages. President Mackenzie requested that Lewis provide "a detailed account of the kinds of poles desired and the estimated cost” to which he replied that the University should collect totem poles "representative of all the principle types of carving that had been produced in the province..." Lewis pointed out that the ethnologist Marius Barbeau had proposed that the University acquire two available poles from the Nass, two to four from the Queen Charlotte Islands and two sets of house poles from the Victoria Island Kwakiutl valued at approximately $5,000. Later that year Chancellor Eric Hamber provided the necessary funding. Barbeau and his assistant Arthur Price procured two communal houses and five totem poles which were transported by ship to Vancouver. In the fall of 1947 the University created a Committee on Totem Poles and at its first meeting the discussion included: restoration by recarving missing parts; treating poles to prevent further decay; painting the poles according to tradition; and selection of site for the installation of the poles. The Committee also proposed that a shed be constructed on the University farm lands to shelter the poles while they awaited repair or restoration. Beginning in spring 1948 a sub-committee supervised the drying, removal of decayed wood, and preservation treatments for the totem poles. In 1949, the University recruited Mungo Martin, Chief Nakapenkem of the Fort Rupert Kwakiutl to restore and paint the old Kwakiutl totem poles. Martin, then seventy years old, had carved most of his life but as the demand for totem poles and other traditional artifacts declined, he had become a commercial fisherman to support his family. Martin welcomed the opportunity to return to his craft and took up residence in a small house on the southern part of campus near the carving shed. The official opening of Totem Park on May 16, 1951 formed part of the UBC Congregation ceremony. The ceremony featured a speech by Martin who, dressed in a button blanket and wearing a head-ring of cedar bark, addressed the audience in his traditional language and spoke about his pleasure in contributing to the preservation of the crafts of the old Kwakiutl culture. (Audrey Hawthorn, “Totem Pole Carver” in The Beaver (March 1952), p. 5. Following the opening of Totem Park, Mungo Martin continued to work on the UBC campus where he carved two new poles which were added to the park. After completing his work at UBC, Martin subsequently moved to Victoria in 1952 where he continued carving in Thunderbird Park until his death in 1968. As significant as was his own work, Martin also left behind an important legacy in the renaissance of totem pole carving through his students who included Bill Reid, Doug Cranmer, Henry Hunt and his son David. During the 1950s the University continued to develop Totem Park. In 1959, UBC engaged the services of Bill Reid and Douglas Cramner and for the next three years they would be responsible for carving a variety of traditional Haida sculptures. The Haida section of Totem Park officially opened in June 1962. 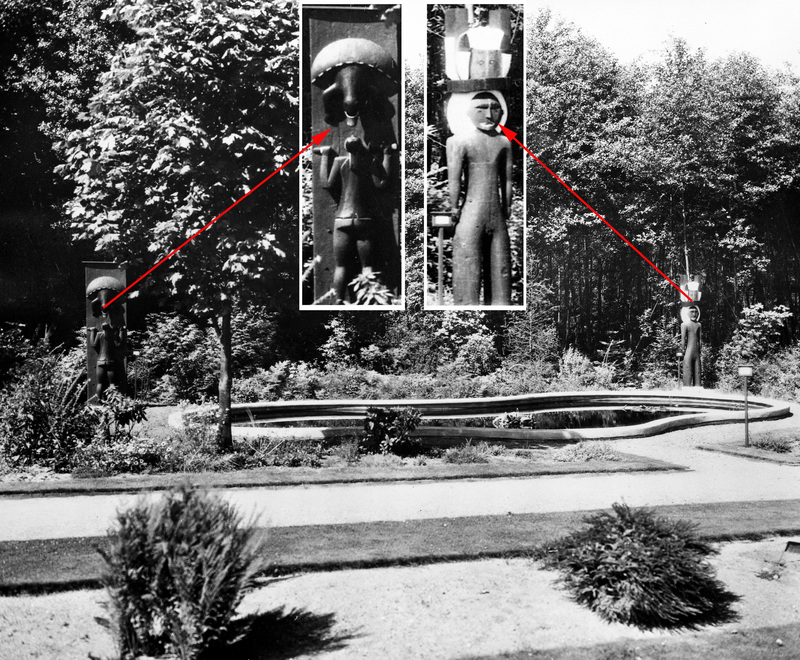 Just prior to the completion of UBC’s new Museum of Anthropology in 1976 the carvings from Totem Park were all removed and transferred to the new facility. NOTE: Contemporary discourse recognizes and uses the names First Nations use themselves (or choose for self-identification). For example, Kwakwaka’wakw is a contemporary form of Kwakiutl. However, historic forms of names are used in this text reflecting the usage of the anthropologists at the time.